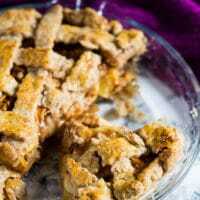 Homemade Apple Pie – Deliciously warm and sweet homemade apple pie. A traditional, comforting autumn recipe favourite! Apple pie is one of my family’s favourite autumn recipes, and I can’t believe I haven’t posted an apple recipe yet! 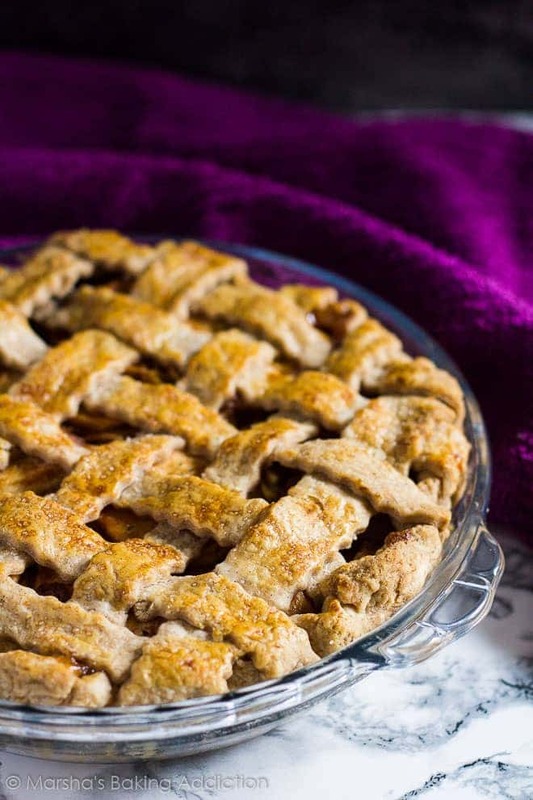 So, today I bring you my warm and sweet Homemade Apple Pie. The filling is spiced with a mix of cinnamon, ginger, and nutmeg, making this pie extra comforting. I have also spiced the homemade pastry with a little cinnamon, too. For the pastry recipe, I have used butter and vegetable shortening for an extra flaky pie crust. Butter for flavour, and shortening for tender flakiness. Make sure the butter, shortening, and water used in the pastry are very cold, and keep your pastry, once made, as cold as possible, too. This helps prevent the fat from melting before baking, which will result in a tender, flaky crust. This also helps prevent shrinking of the crust, too! Try these delicious pies next! 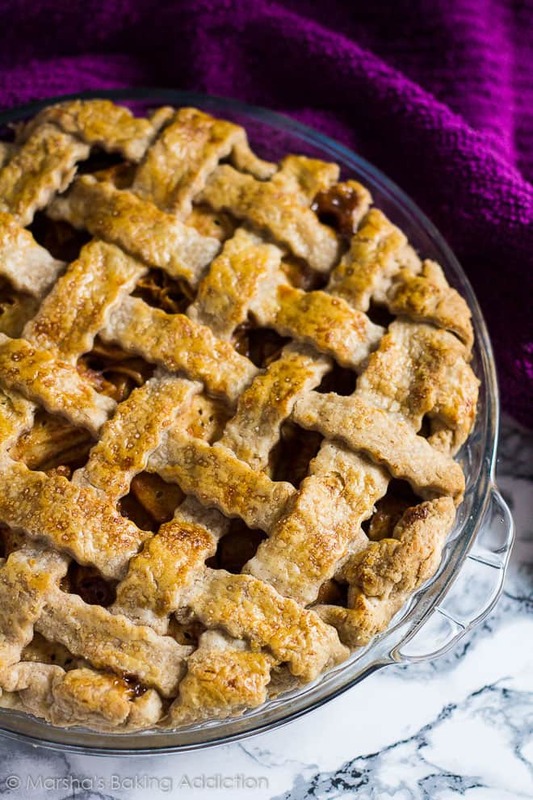 Deliciously warm and sweet homemade apple pie. A traditional, comforting autumn recipe favourite! Using a food processor, add the flour, salt, and cinnamon and pulse to mix together. Add the cold butter and shortening, and pulse until the mixture resembles coarse breadcrumbs with pea-sized pieces of fat left. Add the water, 1 tablespoon at a time, and pulse until the dough begins to form large clumps. Bring together with your hands, then cut the dough in half, and shape into 1-inch thick round discs. Wrap both in clingfilm, and chill for 1 hour. On a lightly floured surface, roll out one of the dough discs to line a 9x2-inch round pie dish. Lightly press into the pie dish, making sure not to stretch. Cut off the excess pastry and shape as desired. Chill until ready to use. Gently stir together the sliced apples, sugar, flour, cinnamon, ginger, nutmeg, salt, and vanilla extract until combined. Set aside. Spoon the filling into the pie crust, and discard any leftover juices. Roll out the other dough disc to a 12-inch circle. Using a pastry wheel, or sharp knife, cut out strips about 1-inch wide. Carefully thread the strips on top of the pie, over and under one another. Press the edges into the bottom crust to seal. Cut off any excess pastry. Lightly brush the top of the pie with the egg mixture and sprinkle with a little sugar, if desired. Bake for 45 - 50 minutes until the apples are tender and the crust is golden brown. After the first 30 minutes of baking, cover the edge of the crust with aluminium foil to prevent excessive browning, if needed. Allow to cool on a wire rack for at least 3 hours before serving to let the filling thicken up. Leftovers can be stored, covered tightly, in the fridge for up to 5 days. 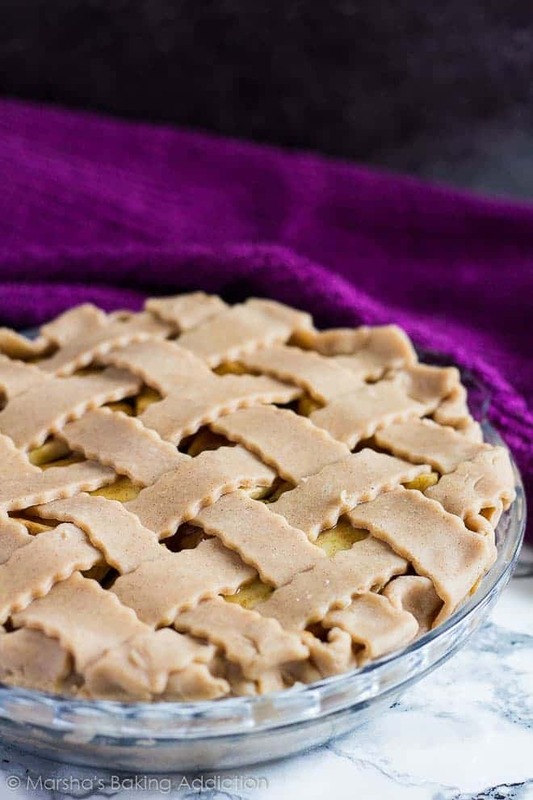 Baked pie freezes well for up to 3 months. Thaw overnight in the fridge before serving. I’m so glad to see a fruit pie on your blog! That crust looks so flakey and amazing! It doesn’t get any better than homemade apple pie. This lattice is beautiful! 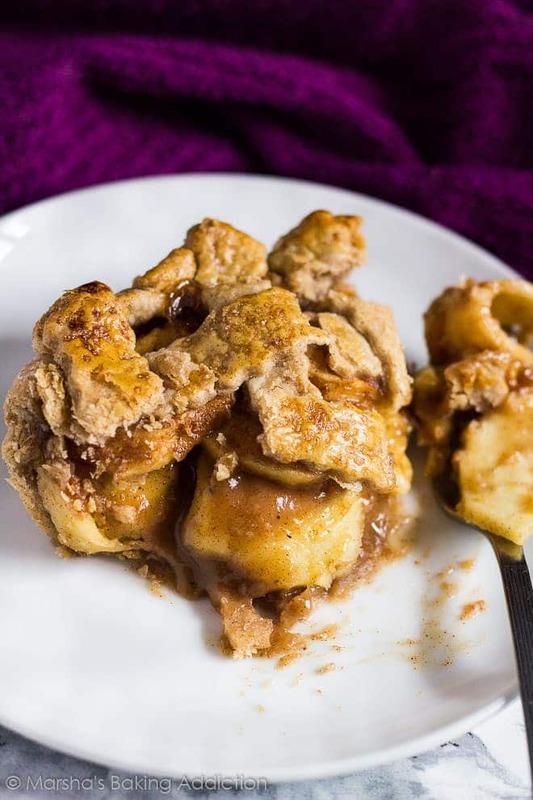 Apple pie is my husband’s absolute favorite dessert this one looks a great one! I love the lattice you made. What exactly did you use to make the wavy edges? Beautiful beautiful apple pie! I love the crust! What a gorgeous pie! Apple is my dad’s favorite– I need to learn how to make it. Looks lovely!! Apple pie is one of my favorites! This one looks amazing! Beautiful pie! I usually stick to blueberry or cherry for my pie making, but I think I’ll have to try an apple pie this fall. Nice looking apple pie you have there. 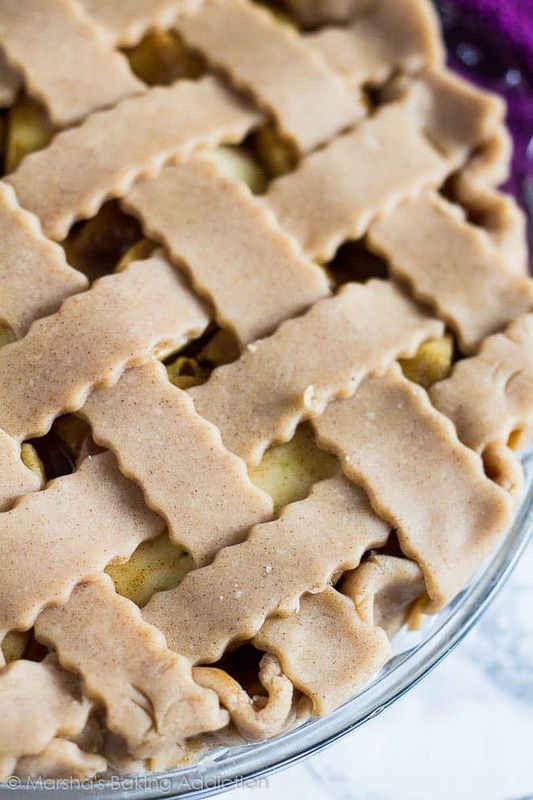 Love the lattice work and perfect for this time of year- apple season! 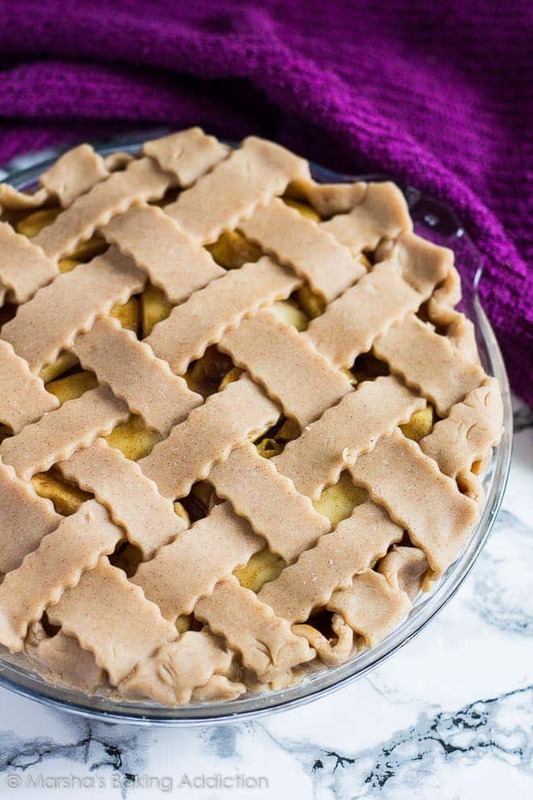 While fruit pies are not my favorite, I can definitely see this as one of my boyfriend’s go-to pies that I’ll have to make this year. Btw, I love your recent photos with the purple background and treats! Gorgeous work. thanks for sharing this recipe, friend. can’t wait to try it out. Wow, nice design, Marsha. Love it. The pie looks tasty, too. 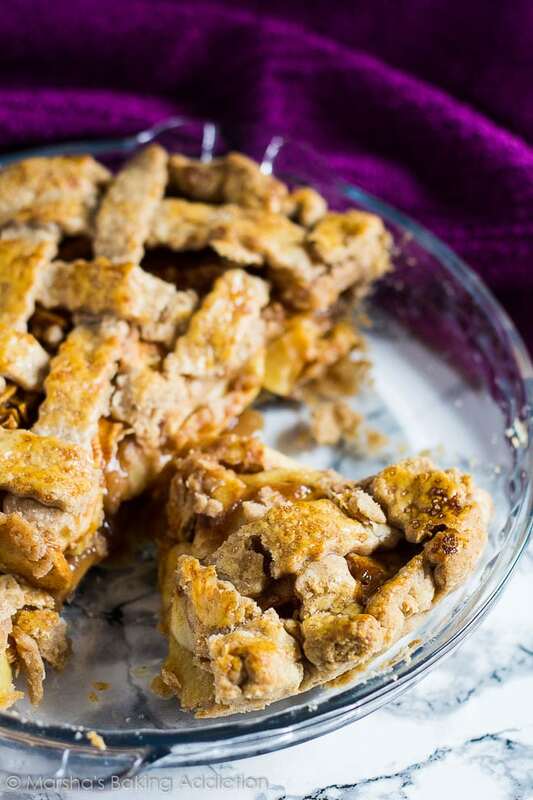 I love the way you describe this recipe – sweet homemade apple pie. Yes, no food could smell like home as homemade food, right. Love your idea.